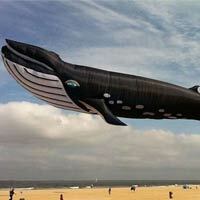 Seen here is an amazing 90 ft long whale kite designed by Peter Lynn. The kite is part of a collection of large kites owned by Stephen Versteegh of the Holland Kite Team, who brings his large kite collection to commercial kite shows and events. People fly their kites to form the shape of a car in the sky on the beach in Berck, northern France, during the 29th “Rencontres Internationales de Cerfs Volants” (International Kite Meeting) which runs from April 18 to 26. Australia’s Festival of the Winds is the country’s premiere kite event celebrated on Sydney’s most famous Bondi Beach. The recent festival took place on September 9th, attracted some 50,000 spectators and hundreds of kite flyers from around the world.